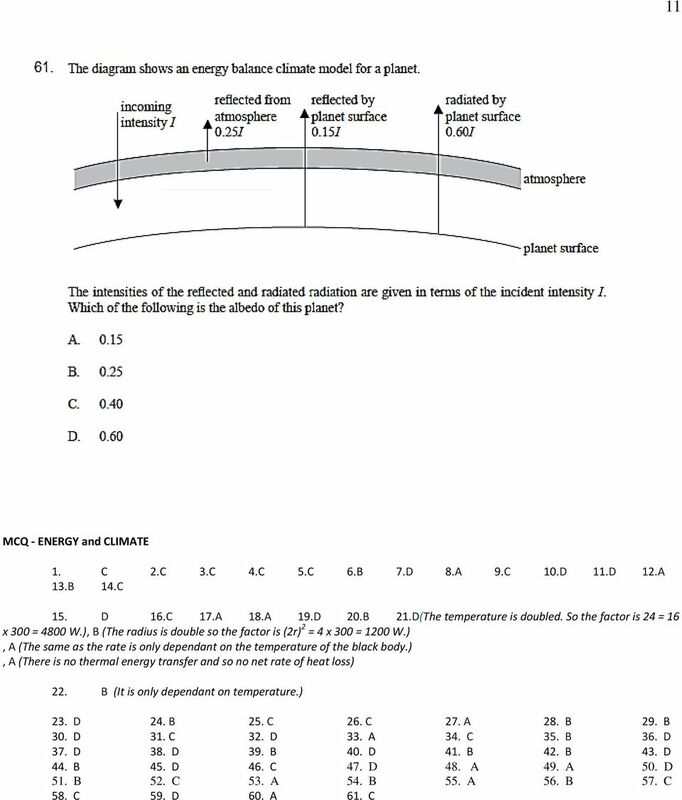 Download "MCQ - ENERGY and CLIMATE"
5 5 26. Doping a semiconductor to improve its conductivity means: A. adding elements with 3 valence electrons B. adding silicon or germanium to the semiconductor C. adding group 3 and group 5 elements D. adding elements with 5 valence electrons 27. Photovoltaic cells can operate when the incident photons have A. frequencies above visible light B. infra-red frequencies C. microwave frequencies D. frequencies below visible light 28. The efficiency of a modern natural gas power station is approximately A. 10 %. B. 50 %. C. 75 %. D. 90 %. 29. The energy source that currently provides the greatest proportion of the world s total energy demand is A. coal. B. oil. C. natural gas. D. uranium. 30. In a nuclear power station, uranium is used as the energy source and plutonium-239 is produced. Which of the following is true? A. Plutonium-239 is produced by nuclear fusion. B. A moderator is used to absorb plutonium-239. C. Control rods are used to slow down plutonium-239. D. Plutonium-239 can be used as a fuel in another type of nuclear reactor. 31. One disadvantage of using photovoltaic cells to power a domestic water heater is that A. solar energy is a renewable source of energy. B. the power radiated by the Sun varies significantly depending on the weather. C. a large area of photovoltaic cells would be needed. D. photovoltaic cells contain CFCs, which contribute to the greenhouse effect. 32. 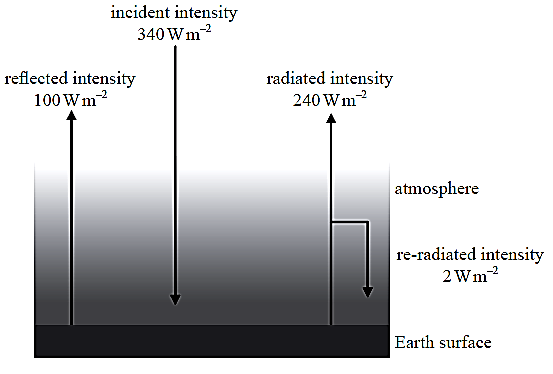 Greenhouse gases A. reflect infrared radiation but absorb ultraviolet radiation. B. reflect ultraviolet radiation but absorb infrared radiation. C. transmit infrared radiation but absorb ultraviolet radiation. D. transmit ultraviolet radiation but absorb infrared radiation. 33. The rate of global warming might be reduced by A. replacing the use of coal and oil with natural gas. B. a reduction in the Earth s albedo. C. a reduction in carbon fixation. D. an increase in deforestation. 34. The unit of energy density of a fuel is A. J m 2. B. J m 3. C. J kg 1. D. kg J 1. 6 6 35. Which of the following is the best estimate for the overall efficiency of a typical coal power station? A. 5 % B. 30 % C. 60 % D. 90 % 36. When sunlight is incident on a solar cell an electric current is produced. This is due to A. a temperature gradient within the cell. B. very long wavelength infrared radiation. C. very short ultraviolet radiation. 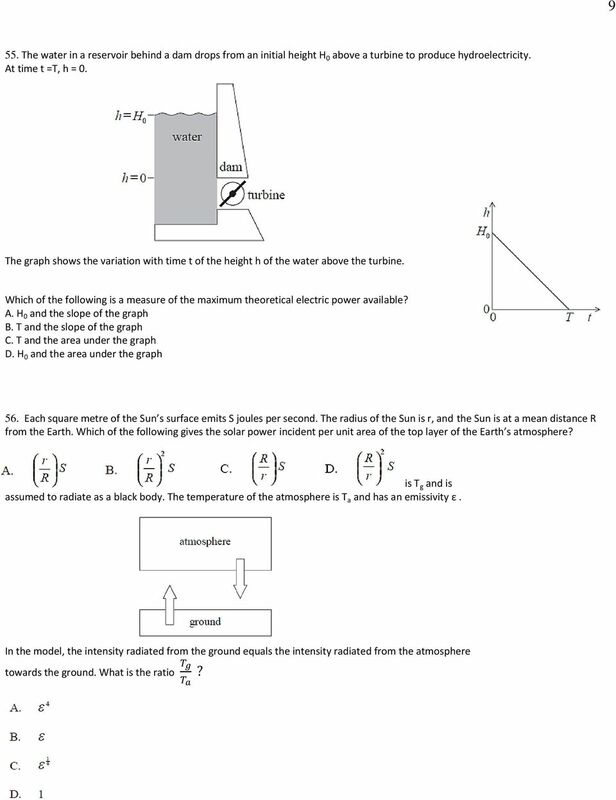 D. the photoelectric effect. 37. The power per unit length P of an oscillating water column (OWC) is due to the action of a surface wave of amplitude A. 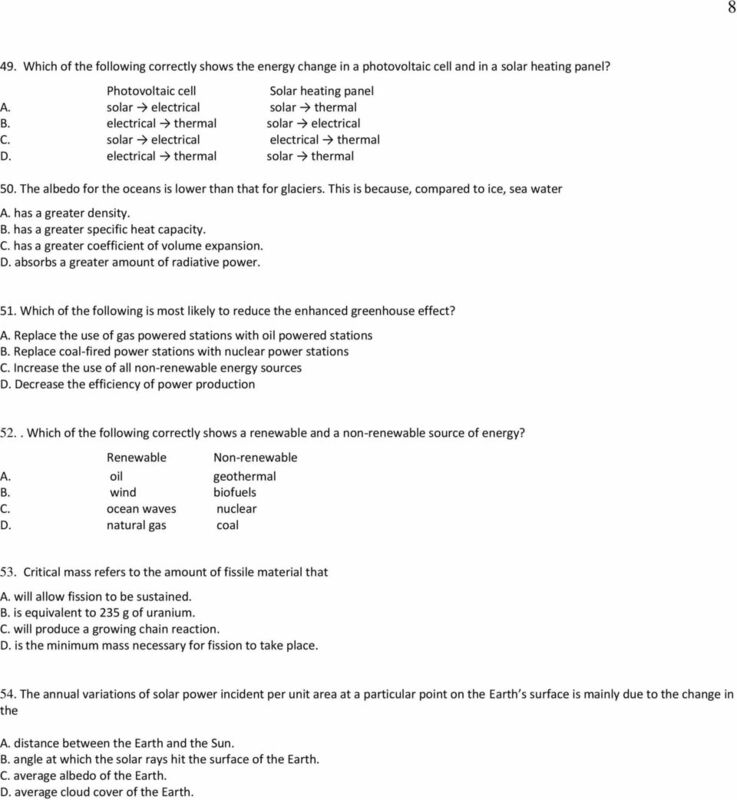 Which of the following correctly relates P and A, and correctly identifies the nature of the energy of the water column? 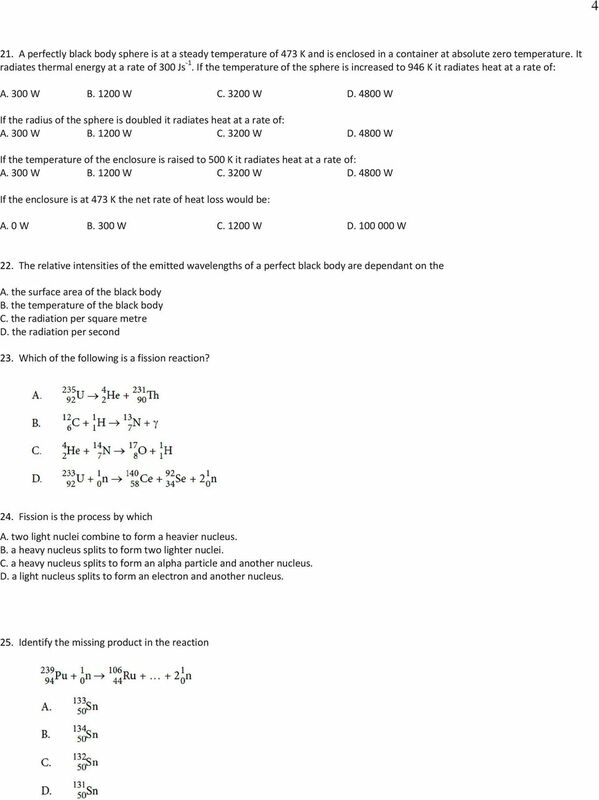 Relation between P and A Nature of energy A. P A kinetic B. P A kinetic and potential C. P A 2 kinetic D. P A 2 kinetic and potential 38. The average temperature of the surface of the Sun is about 20 times more than the average surface temperature of the Earth. 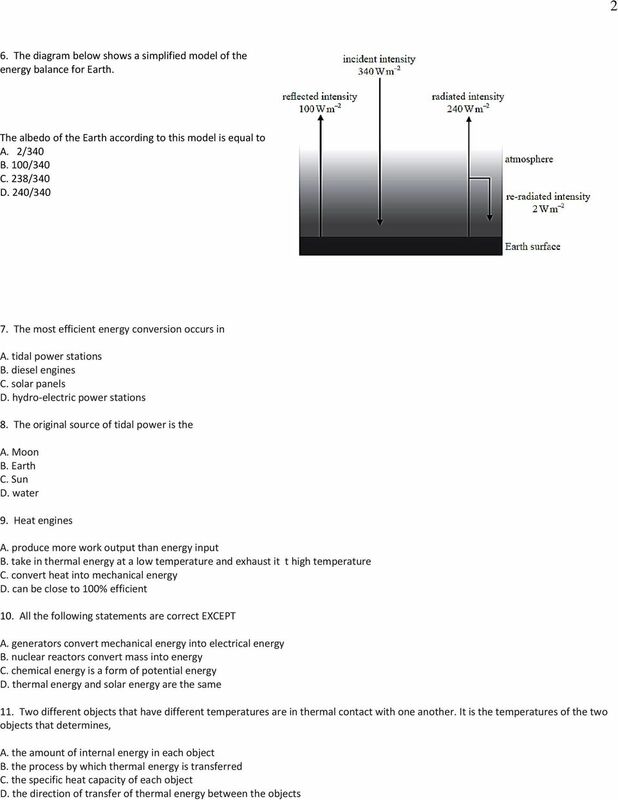 The average power per unit area radiated by the Earth is P. The average power per unit area radiated by the Sun is A. 20 P. B. 400 P. C P. D P. 39. Global warming reduces the ice and snow cover on Earth. 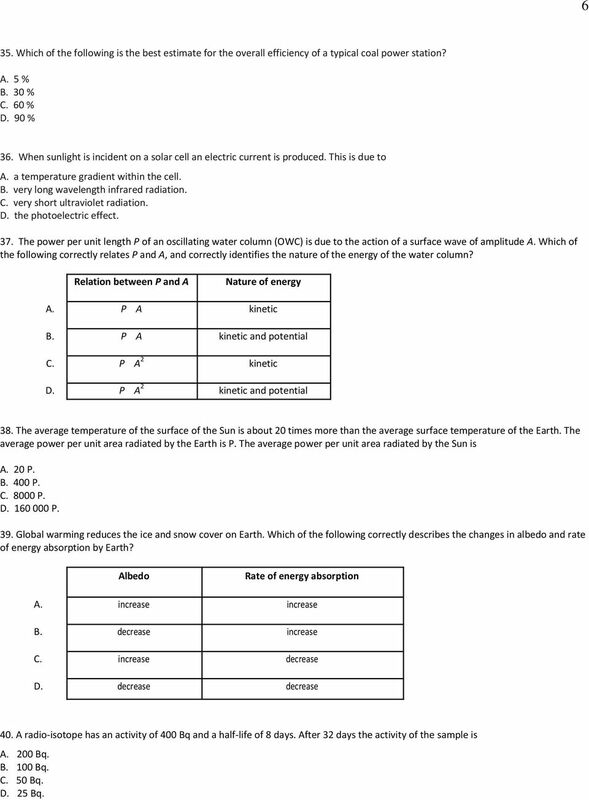 Which of the following correctly describes the changes in albedo and rate of energy absorption by Earth? 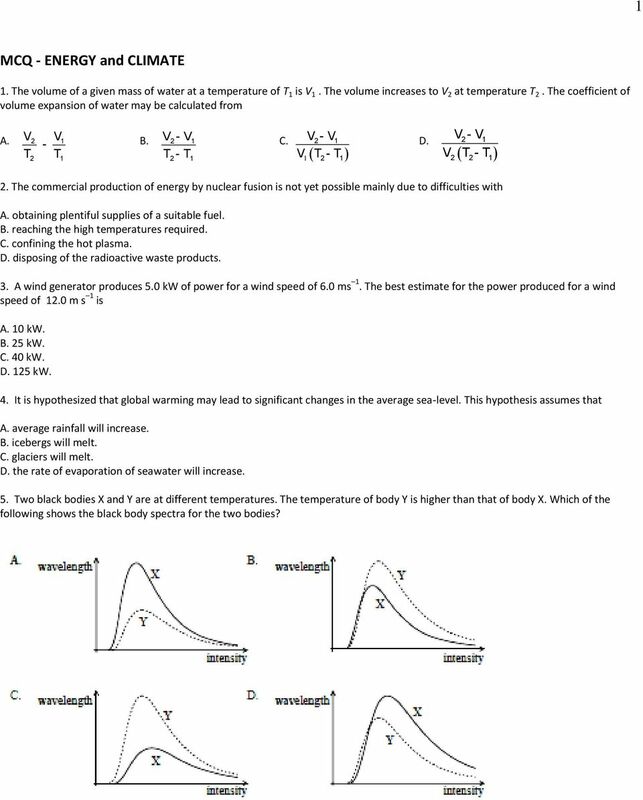 Albedo Rate of energy absorption A. increase increase B. decrease increase C. increase decrease D. decrease decrease 40. A radio-isotope has an activity of 400 Bq and a half-life of 8 days. After 32 days the activity of the sample is A. 200 Bq. B. 100 Bq. C. 50 Bq. D. 25 Bq. 8 8 49. 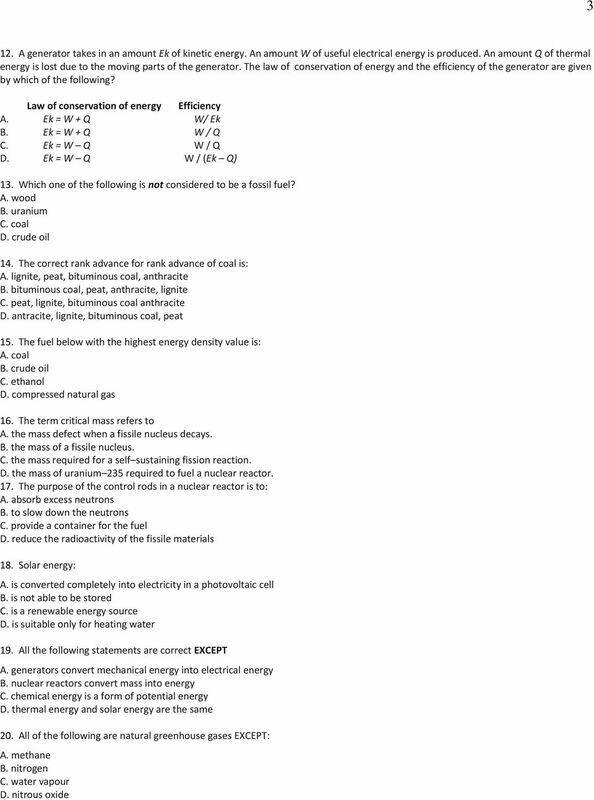 Which of the following correctly shows the energy change in a photovoltaic cell and in a solar heating panel? Photovoltaic cell Solar heating panel A. solar electrical solar thermal B. electrical thermal solar electrical C. solar electrical electrical thermal D. electrical thermal solar thermal 50. The albedo for the oceans is lower than that for glaciers. This is because, compared to ice, sea water A. has a greater density. 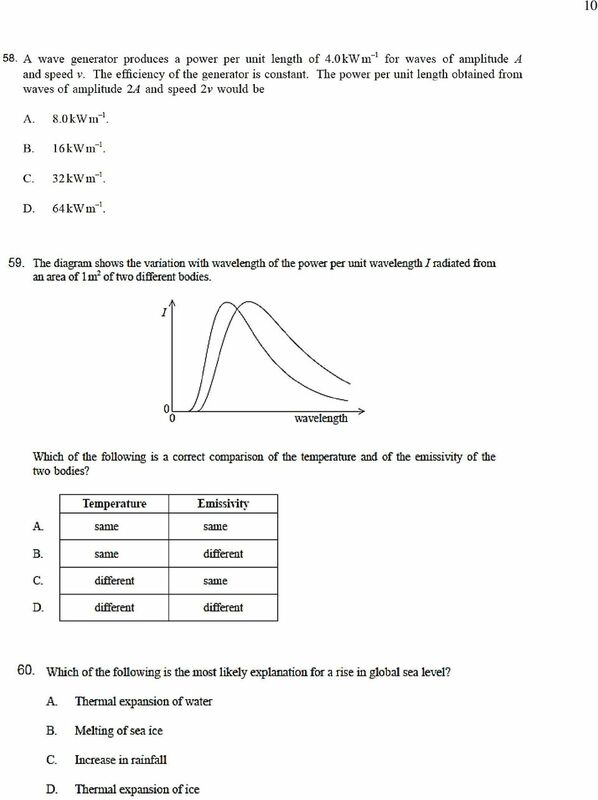 B. has a greater specific heat capacity. C. has a greater coefficient of volume expansion. D. absorbs a greater amount of radiative power. 51. 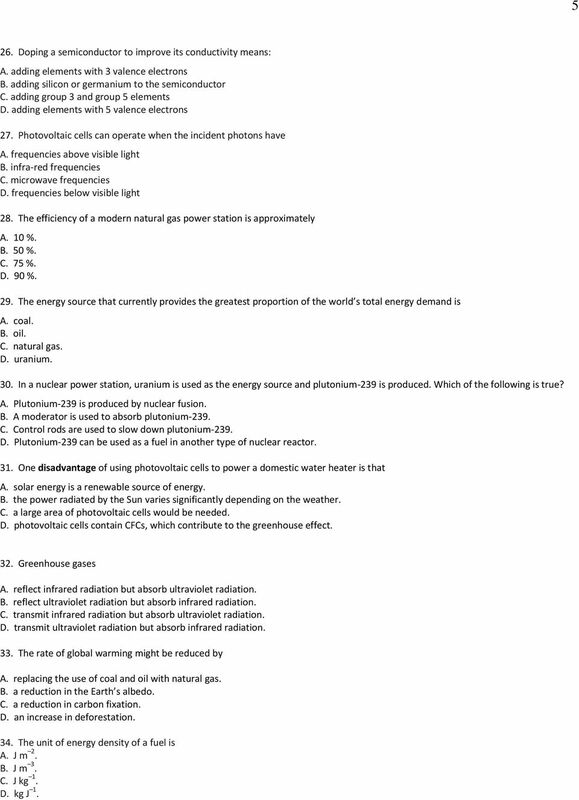 Which of the following is most likely to reduce the enhanced greenhouse effect? A. Replace the use of gas powered stations with oil powered stations B. Replace coal-fired power stations with nuclear power stations C. Increase the use of all non-renewable energy sources D. Decrease the efficiency of power production 52.. 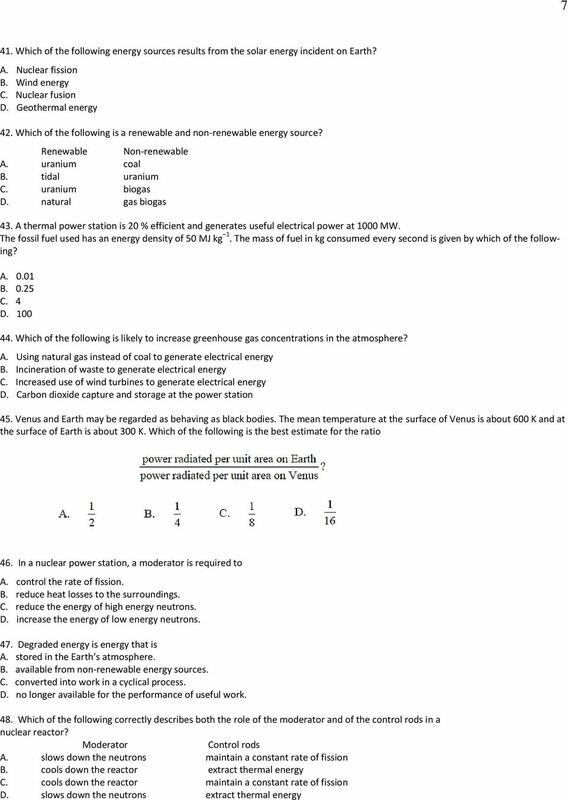 Which of the following correctly shows a renewable and a non-renewable source of energy? Renewable Non-renewable A. oil geothermal B. wind biofuels C. ocean waves nuclear D. natural gas coal 53. Critical mass refers to the amount of fissile material that A. will allow fission to be sustained. B. is equivalent to 235 g of uranium. C. will produce a growing chain reaction. D. is the minimum mass necessary for fission to take place. 54. The annual variations of solar power incident per unit area at a particular point on the Earth s surface is mainly due to the change in the A. distance between the Earth and the Sun. B. angle at which the solar rays hit the surface of the Earth. C. average albedo of the Earth. D. average cloud cover of the Earth. Basics of Nuclear Physics and Fission A basic background in nuclear physics for those who want to start at the beginning. Some of the terms used in this factsheet can be found in IEER s on-line glossary.